The Mississippi Department of Education released letter grades for schools and districts based on Mississippi’s A-F accountability system that evaluates how schools and districts performed in the 2016-17 school year. District grades for 2016-17 include 15 “A” districts, 43 “B” districts, 43 “C” districts, 36 “D” districts and 9 “F” districts. 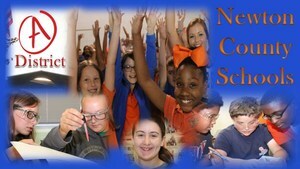 Newton County School District rose from a B district in the 2015-16 school year to an A district, finishing 15th in the rankings for school districts with 668 total points. The Mississippi State Board of Education approved the 2016-17 accountability results during its Oct. 19 Board meeting. The 2016-17 accountability grades are based, in part, on how well students perform and progress from year to year on the Mississippi Academic Assessment Program tests for English language arts and Mathematics. These tests are aligned to the Mississippi College and Career Ready Standards and are administered annually to students in grades 3-8 and in high school. With the exception of fourth grade ELA and English II, student achievement increased in both ELA and Mathematics in all grades from 2015-16 to 2016-17. The accountability system also factors in how well students perform on science tests in grades 5 and 8. Accountability grades for high schools and districts include the four-year graduation rate, student performance on Biology, U.S. History and ACT tests, and student participation and performance in advanced coursework such as Advanced Placement and dual credit/dual enrollment courses. The accountability system places an emphasis on the progress students make in ELA and Mathematics from year to year, particularly the lowest performing 25 percent of students. The 2016-17 accountability data was used to set a new baseline to determine the thresholds for earning each letter grade. The Mississippi State Board of Education decided in August to set a new baseline to correct artificially high growth rates included in the 2015-16 grades. For the 2016-17 accountability grades, districts and schools have been awarded the highest grade they were able to achieve based on current thresholds or the new baseline for 2017-18. The highest grade is the official grade, though both possible grades have been published for transparency.